The caring mission of the founding Sisters is fulfilled each and every day by our dedicated staff. Our warm and positive atmosphere blossoms from the staff's commitment to each resident and is reflected in our consistently high resident satisfaction scores. Everything we do comes from our sincere dedication to do what's right for the residents. We value the gift of life and show respect for each person's human dignity and uniqueness. 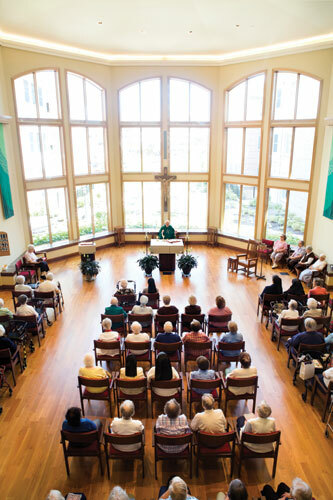 We create an atmosphere conducive to the expression of faith and nurturing of the spiritual dimension of life. We promote lifelong development and holistic growth of the individual. 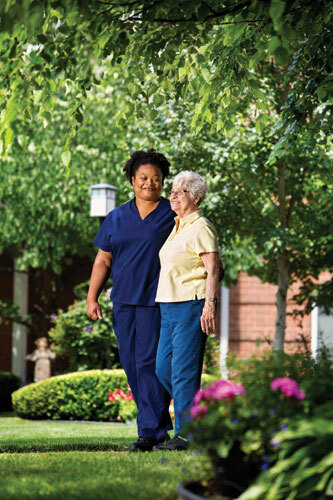 We share an attitude of compassionate service and concern for our residents. We are dedicated to creativity and excellence in all of our work and services. We provide mutual support, justice and collaboration in relationships with our staff, residents, and their families. Based upon its mission of providing health care, housing, and related services to the elderly in a spirit of compassion and hospitality, The Sarah Community has a program of financial assistance for new and continuing residents. Since its inception in 2001, The Sarah Community’s financial assistance program has continually achieved its goal of providing services to persons unable to pay the full cost of their care, and no resident has been asked to leave because of an inability to pay. Our focus on residents' spiritual and physical needs calls us to our best, and makes us unique.